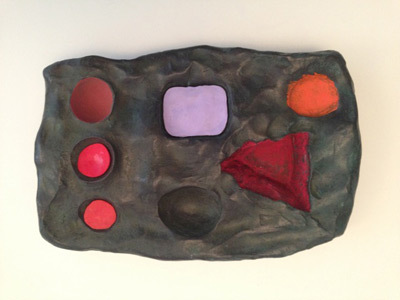 The present exhibition, Palettes, consists of painted concrete and bronze wall-mounted works. This new series is consistent with Verzutti's ongoing investigation of formal sculptural properties via a playful mix of material experimentation and representational content. Suggestive of vessels or cases, these "palettes" are at once traces of production (bearing the mark of their maker) as well as portraits of a kind…semi-representations of tools (make-up cases, art supplies) as well as evocative of places and their remnants.